Due to Instagrammers and brunch fanatics, the historic Grand Central Market is nowadays ubiquitously associated with the infamous Eggslut. Eggslut’s sumptuous breakfast and lunch offerings, all with a single ingredient in common (you can guess what it is), have earned it widespread popularity. While Eggslut may be a must-try during your four years at USC, its site, the Grand Central Market, is a mere hop and a skip away from University Park and home to a smorgasbord of other edible, meritable options. Together, the vendors at Grand Central Market comprise a freshly brewed blend of trendy, upscale retailers and family-owned businesses steeped in culture. Vendors to put on your radar include G&B Coffee and DTLA Cheese. At G&B, treat yourself to an order of artisan coffee (the Coconut and Macadamia latte is a fan favorite) to help soothe your long wait in Eggslut’s line. If you’re feeling more adventurous, take a chance with the “Fizzy Hoppy Tea” – a bubbly hops-infused drink that’s sure to stir up vague recollections of past Friday night or tailgating shenanigans with a taste that eerily evokes beer. Then, even if you don’t plan on buying the perfect cheese to pair with your Two-Buck Chuck, stop by DTLA Cheese’s booth for a cheese experience that the local Ralph’s can’t beat. As you traverse through the market, you’ll inevitably mosey past a good number of the various vendors serving up ethnic and ethnic-inspired eats. Choices range from Thai sticky rice to Salvadorean pupusas to Middle Eastern kabobs served up from a range of hip-looking booths to more pragmatically designed stalls. There’s also Wexler’s Deli which is serving up authentic Jewish deli style sandwiches — a little bit of New York in downtown. Even if you’re too full to buy an order of tacos from one of the several Mexican food vendors, you can still appreciatively watch as staff deftly assemble a plate of food. Browse around and see an art form take place in front of your eyes. While newcomers to the market like Eggslut and G&B have a magnetic appeal due to their slick aesthetics and quasi-gourmet offerings, make sure to give a look around at the various dry-goods and grocery vendors. The market’s bustling atmosphere wouldn’t be complete without them. For example, if you feel your sweet tooth suddenly calling for your attention, check out La Huerta. This vendor specializes in assorted gummies, trail mixes and Mexican candies you can purchase in bulk. Since college is all about trying new things, engage your tastebuds in a new sensory experience through the sweet and spicy flavor combination popular in many Mexican sweets. Also interspersed among the stands dedicated to immediate edible gratification are the vendors devoted to fresh produce you can purchase to take back to your humble abode. While all the produce may not meet the perfectly plastic sheen of the produce found at corporate grocery stores, they’re worth a look. Chances are that you’ll have to rummage around to find fruits or vegetables that aren’t too bruised or appear fresh enough to last a week in the fridge, but nevertheless, the produce vendors at Grand Central Market offer a selection of cheap goods, which altogether constitute refreshing departures from standard grocery store fare. As a last hurrah before you head back to your dorm or apartment, try opting for a liquid refresher to help wash down everything you’ve been noshing on throughout your visit. If you’re a firm believer in green juices and all things purportedly wholesome, stop by the Market’s resident juice stand, Press Brother’s Juicery. If healthy juice is too grassy for your taste buds but you’re still in want of a healthy thirst-quencher, check out Better Booch, a bar serving up what else but… kombucha? If you feel the slightest twinge of sadness as you depart because you didn’t get the chance to take in everything the market has to offer in one afternoon, don’t worry. Grand Central Market, with its irresistible smells of freshly cooking food wafting over head and its mish-mash of patrons ribboning around the aisles, will patiently await your next visit. 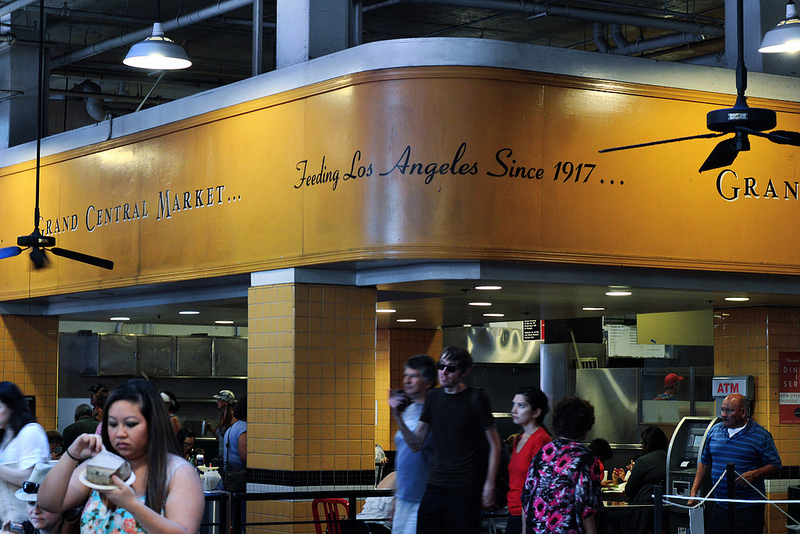 The market is located at 317 S Broadway, Los Angeles, CA 90013. Take the Metro Red or Purple line and get off at Pershing Square Station.